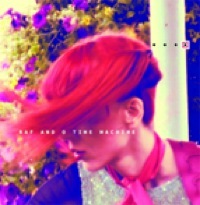 A Bow To Bowie Is here! Truly excited to share this with you! ‘A Bow To Bowie’ and ‘A Mechanical Ride’ are available now together with pre-orders of The Space Between Nothing And Desire on Telephone Records. 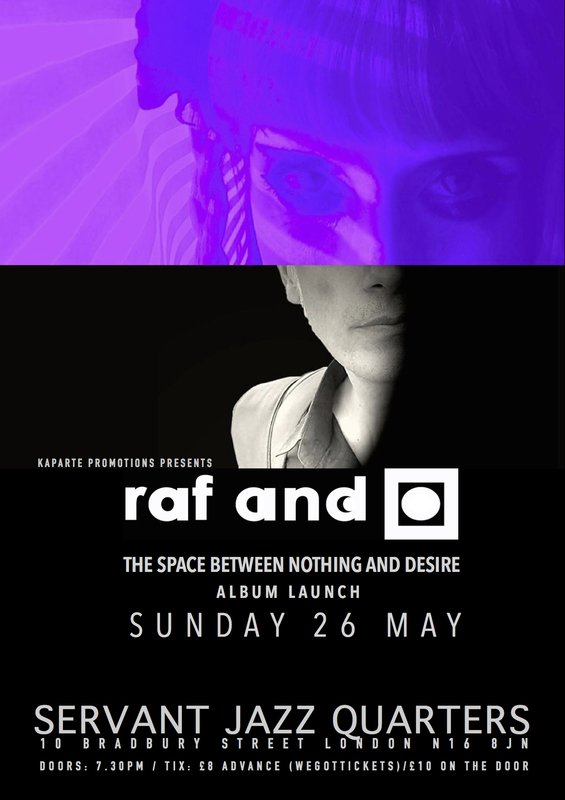 The Album Launch will be on Sunday 26th May in the intimate and elegant space of SJQ, Servant Jazz Quarters, London, promoted by long time dear friend Klarita from Kaparte Promotions. We’re incredibly excited to be able to bring ’The Space Between Nothing And Desire’ live to you! 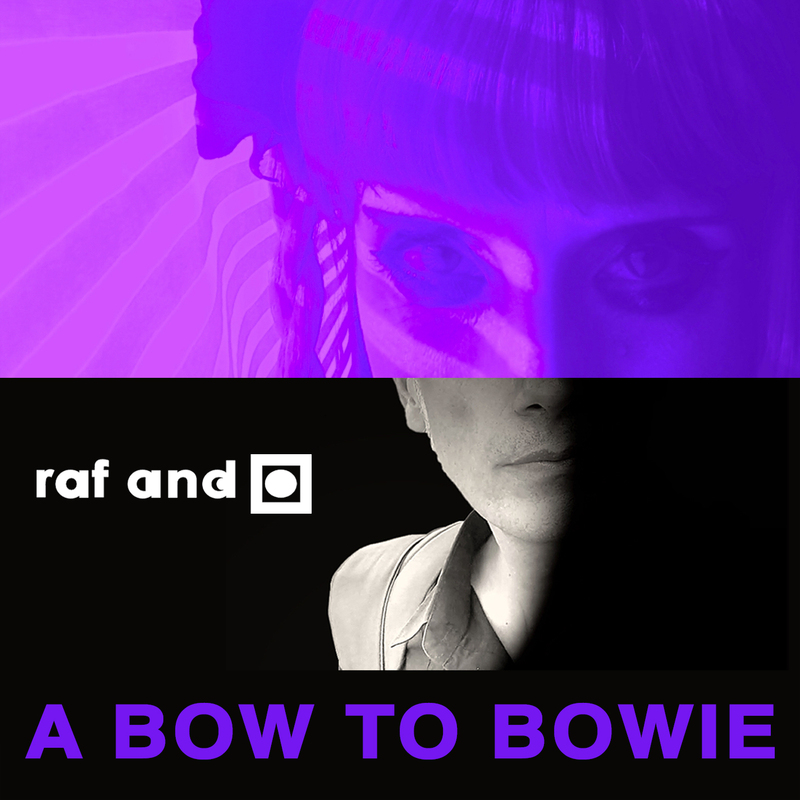 Over the years Raf and O have expressed their affinity with Bowie and took on the task to reinterpret some of his songs, including ‘The London Boys’ which is part of the new album. September saw the announcement of ABTB and on January 8th it was revealed to be ‘A Bow To Bowie’, written in December 2016. With ‘The Space Between Nothing And Desire’ Raf and O go in search of a new quest: where, or, what is the space between nothing and desire? The primal concept that makes the world go round, desire, is abstract and yet so tangible, juxtaposed to nothing, equally as baffling, as to truly imagine it, it is impossible. With these parameters forming their chart, the latest album captures the duo navigating a journey into the senses, into the longing and the belonging. ‘Such A Small Love’ is a cover of Scott Walker recorded in September 2016. Lovingly mastered at Trace. Big thanks to Mark Beazley. In February we were celebrating the latest live achievements which saw Raf and O in the latter part of 2018 alongside our other selves The Kick Inside, performing selective shows along the East Coast of England and surroundings including Manor House and theatre shows, as well as live appearances at the Klinker, Bethnal Green Working Mens Club and at the mighty PennyblackMusic 20th Anniversary held in the Water Rats quarters; the latter was John Clarkson’ s favourite show of 2018 whilst Raf and O as The Kick Inside – The Songs Of Kate Bush is in Adrian Ainsworth round-up of favourite live music of 2018. “…An entrancing set of slanted, left-field songs that work their hazy magic on a drunken summer day. 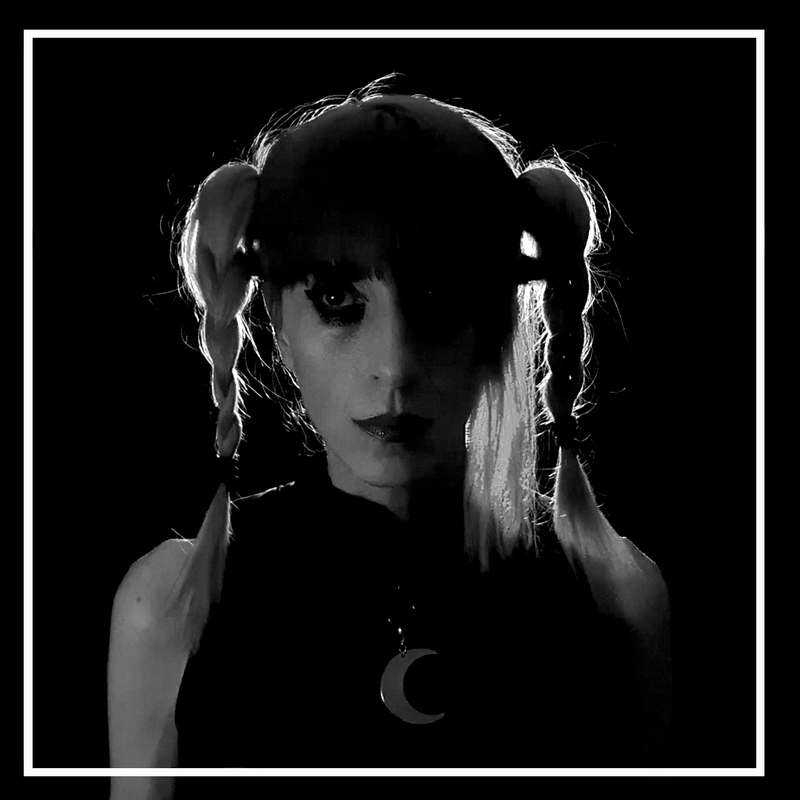 Comparisons to Broadcast, Stereolab, and even – yes – Kate Bush might help, but in reality Raf and O exist in their own, idiosyncratic universe, with a deeply unique sound that everyone should fall into for a while” Dominic Simpson, Pennyblackmusic. Live performances will also bring us to Birmingham on 7th April at Fletchers Bar with TKI and at West Kirby Arts Centre where we will perform both as TKI and Raf and O on Saturday 18th May. More info and events on Raf and O and The Kick Inside FB pages. Join us for the launch, it will be a very special night in London! ‘The Space Between Nothing And Desire’… don’t miss! Raf and O – ABTB 4 Letters for 4 Words + Mini Tour Coming Up! Greetings! we are very happy to announce that our next single is almost here! ABTB, 4 letters for 4 words. To be revealed and to be unleashed as the days shorten … we are very excited! And we are taking shows up and down the country, road testing some new pieces along the way. Raf and O and The Kick Inside are about to embark on a few gigs, crossing paths at times, like ships in the night! Kicking off at The Water Rats, London celebrating Pennyblackmusic magazine 20th Anniversary! Tickets are on sale now, all details here below! There’s an article on The Northern Echo for the upcoming show in County Durham and in view of this Saturday’s celebration, here’s an interview we did for Pennyblackmusic 2 years ago. And big thank you to The Pheasantry (Pizza Express Live) for hosting us last June, loved the Steinway! Last month, it was very sad to learn about the passing of Lindsay Kemp. I feel very honoured to have met him two years ago and in chatting to him amongst other things how I spent a big part of my life in England just like he spent a good length of his time in Italy. 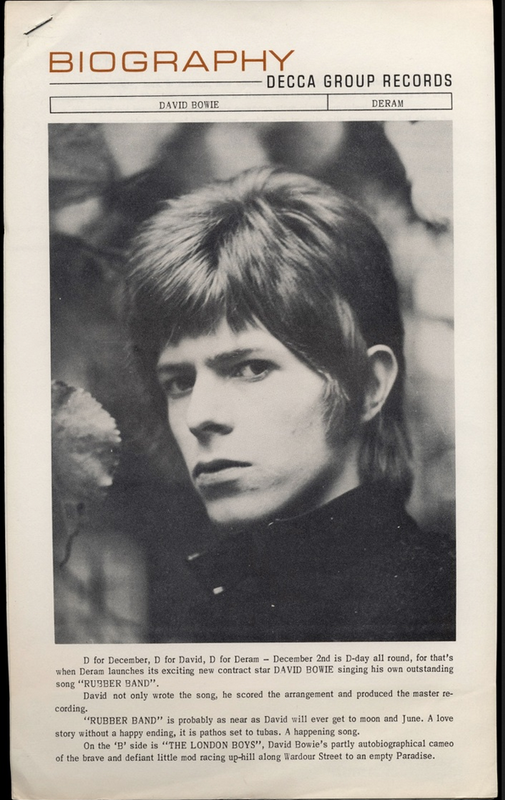 A wonderful unique artist full of poetry and charm, also mentor to some of the best …David Bowie, Kate Bush… He’ll be sorely missed. (See on FB). We’re both very much looking forward to perform and to bring you our latest efforts throughout the next few months! We did it, we launched The Kick Inside – The Songs of Kate Bush project! Thank you to Kaparte Promotions! 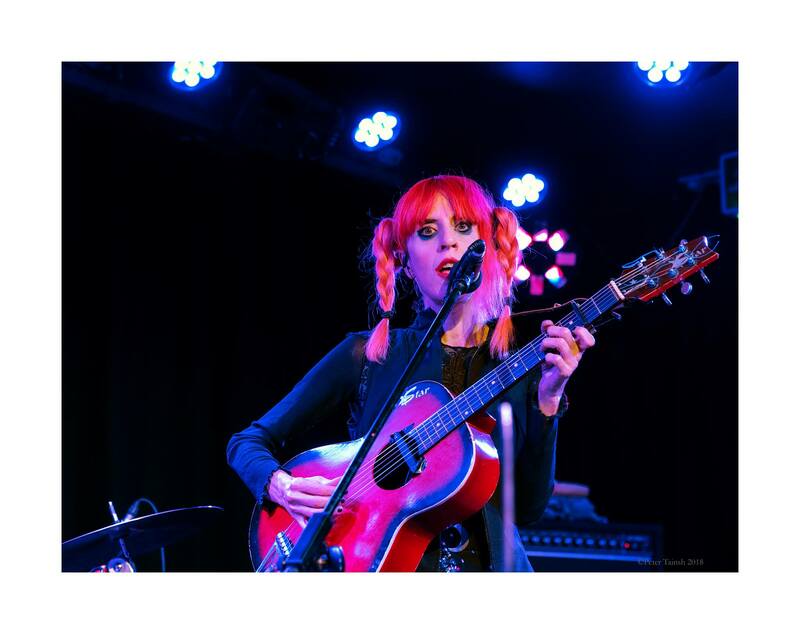 Here are the magical photos by Angelique Le Marchand capturing the night beautifully. We also had a wonderful time on the deXter Bentley Show, Resonance FM on the 40th anniversary of Kate Bush’s debut album. Listen to the podcast. Very grateful for the audience reception and the excellent reviews and blogs! After such a great response, we are playing in London again, this time appearing at the legendary Pheasantry in Chelsea, Pizza Express Live on 1st June. In the meantime Raf and O “as themselves” shall also be playing live shows whilst putting finishing touches on the upcoming fourth album; we have been invited to be part of the excellent Pennyblackmusic Magazine 20th anniversary at The Water Rats, London (TICKETS); can’t wait to perform! And tonight, 18th May we are making a live appearance at Scaledown #139, The King and Queen, Fitzrovia, details on the Live page. There will be more special shows in the latter part of the year as we gear up towards our latest releases …..! Watch/ Listen to the live video montage of the night we put together (below) from The KIck Inside Launch and then get your tickets for the Pheasantry or other dates on the TKI Website! Big thanks to Peter Cook, Katya Fowler, Lee Winter for phone footage. It’s 2018 and we’re kicking off with live activities again! Kate Bush has given music lovers something to treasure: a great musician and producer, a brilliant composer and an amazing most unique voice. This year and month marks the 40th anniversary of Kate and her debut album. 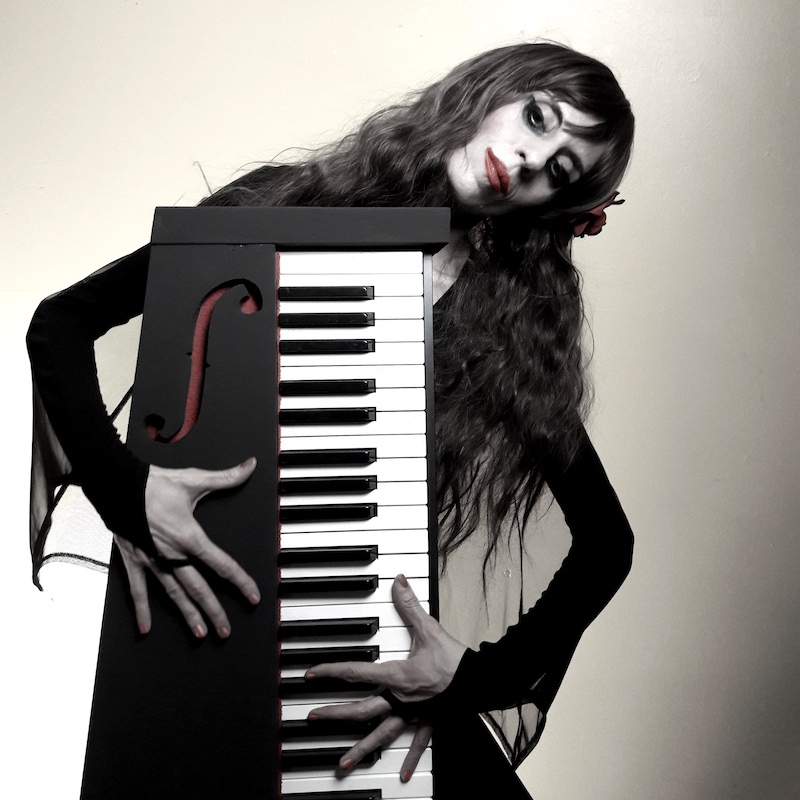 Adopting their name from this album,TKI or The Kick Inside, a tribute to Kate Bush by Raf and O (see previous blog), perform tracks from her early albums fully live, elegantly and stylishly capturing the energy, excitement and fragility of Kate’s music on vocals, piano and double bass. 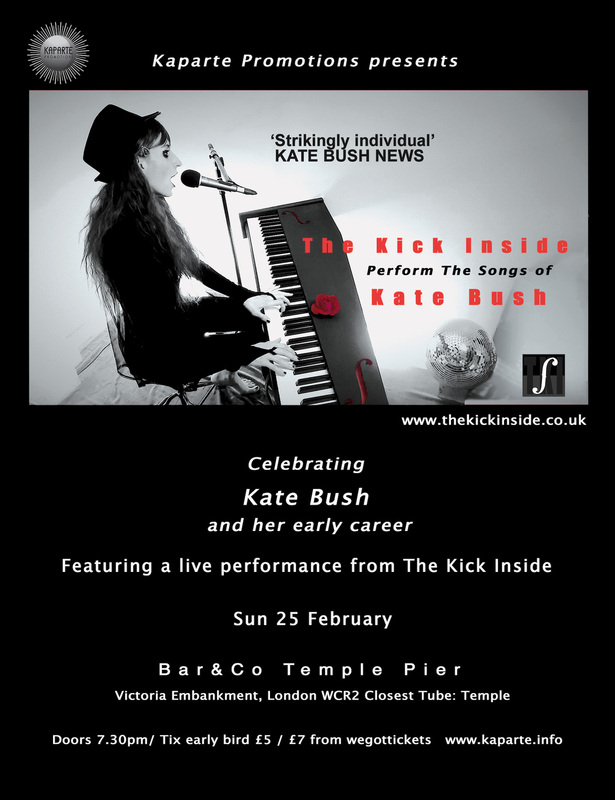 Celebrating Kate, The Kick Inside Launch, promoted by the always excellent Kaparte, is in London at Bar & Co, the club on a boat, Temple Pier, on Sunday 25th February. It is also O Richard’s birthday and Raf, will keep celebration on hold till then. And to kick start it all off, The Kick Inside will be playing live in session on the mighty deXter Bentley Show on London’s Resonance 104.4 FM, Saturday 17th February, 12pm which is the date marking Kate’s debut album 40 years ago! We’re now gazing ahead to … and we’re very excited to introduce ‘The Space Between Nothing And Desire’. 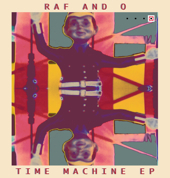 That is the title of Raf and O’s new album and it’s set to be released later this year! A slice from the album was aired yesterday for the very first time on the deXter Bentley Show: an edit preview of a brand new Raf and O song, ‘Your Gazing Stare’. The album will also include our version of David Bowie’s ’The London Boys’. We can’t say too much more at this stage, but keep your ears and eyes peeled, social media is always the quicker way to get fresh news! Last November we even got to say thank you in person for the support Mike Garson had given to our version of Bowie’s Lady Grinning Soul back in 2013 after he played a magical show at the Camden Underworld! See you down at THE KICK INSIDE LAUNCH. Come! July greetings from Raf and O! This is an entirely separate music outfit, named after Kate Bush’s first album and it’s a tribute to the artist herself! We’ve also been busy with Raf and O and you can read more on the latter part of this blog. I’ve been doing a lot of piano playing recently on the latest and beautiful addition to the instrument roster: a lovingly converted piano keyboard by O featuring f holes! 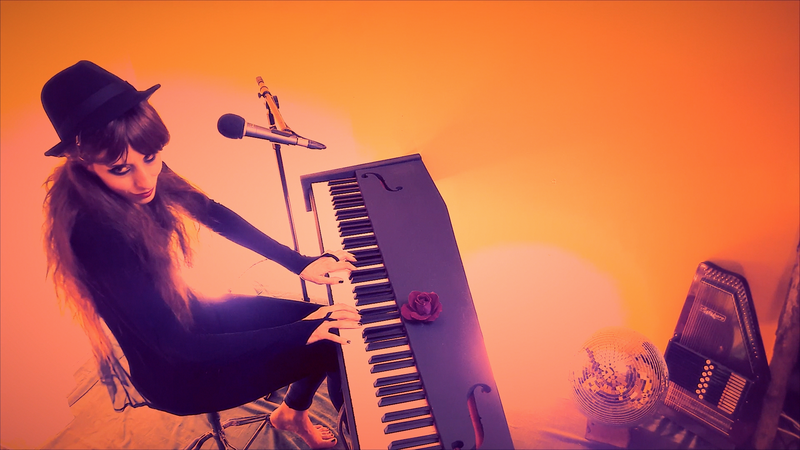 Last May we announced it on our facebook page – As well as cracking on with writing material for our 4th album, and reinterpreting favourite artists, mainly David Bowie interpretations, I’m starting a tribute to the music of Kate Bush, where I will sing and play piano extensively, focusing on the early part of Kate’s career and this time, keeping faithful to the original pieces. Since then we’ve got a new TKI website up and running and just over a week ago we released our very first video, recorded live in The Warm Room, which received a great reception. The Kick Inside, as well as the solo show, will also perform as a duo and here, O will be alongside me but in a role that may be a surprise for many amongst you. 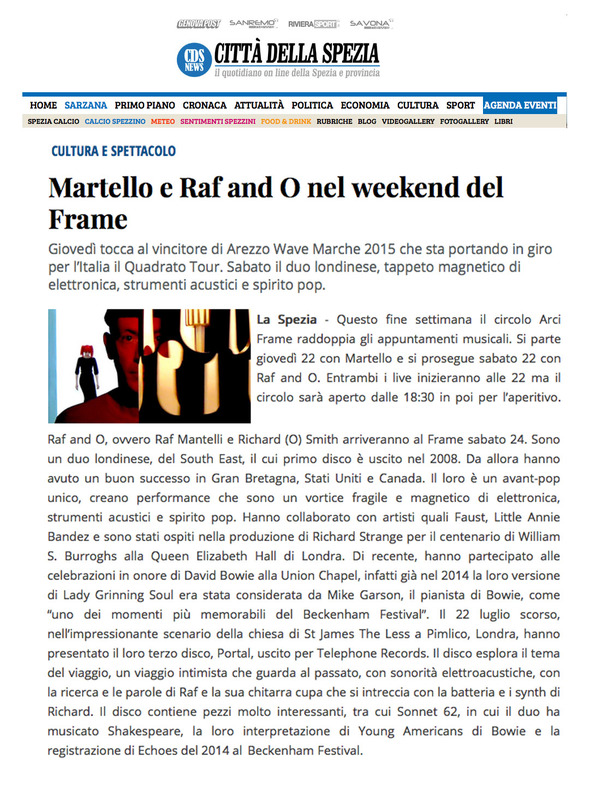 Raf and O will return to Italy to play a small series of shows and look forward to go back to some favourite places during the tour! We will debut some new material and there will be a few surprises along the way too! Already looking forward to seeing friends old and new and very excited about the set we will be playing! As well as developing the TKI project we’ve been also writing material toward a new album; this has been keeping us focused in the studio, so it was lucky if you managed to catch Raf and O playing earlier this year including the legendary experimental Klinker Club and a charity show to raise awareness on mental health for Punk4MentalHealth at the UnderDog Gallery. Our own cover interpretation of David Bowie’s ‘The London Boys’ received radio play on the latest Chaos Theory Radio Show where Kunal was joined by Alan Pride for a selection of cool tunes! It was also aired on the Dexter Bentley Show Resonance FM and our Bowie’s cover of ‘Win’ was aired, again on Dexter’s ‘The Day Before’ , a tribute to David which also featured an extract from Mary Finnigan’s book ‘Psychedelic Suburbia: David Bowie and the Beckenham Arts Lab’ plus an interview with her; we were deeply touched by Mary’s words for Raf and O who introduced us on the show. 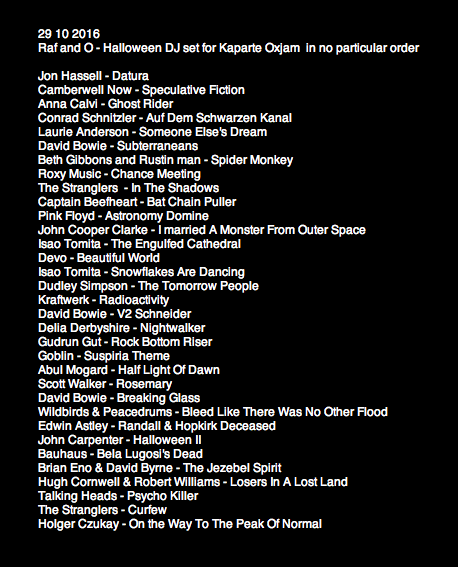 And lastly, Raf and O’s Magic from our latest album Portal that was mastered at Cage studios is included in a new free to download compilation ‘Cage 24’ by Martin Bowes from Attrition, pioneers of darker electronica. For fresh up to date news join our Raf and O social media pages, FB and Twitter and watch this space! Today would have been David Bowie’s 70th birthday. Last year was tough and performing at the Union Chapel in his honour felt right, even if strange. We then released ‘Win’ on our last album ‘Portal’ and by the time of Bowie’s Beckenham Oddity (The Beckenham Free Festival Remake) it was easier to smile. Always an influence, we’ve been featuring his tracks in the live sets for a few years and getting a thumb up from Mike Garson for our take on ‘Lady Grinning Soul’ was very special – so to celebrate this special day we have recorded our version of ‘The London Boys’, a Bowie gem from 1966! And leaving electronics aside, this is us at our most acoustic: I play piano and sing and O plays guitar. Electronic Sound Reviews Portal, Raf and O Cover Scott Walker, Bowie Reflections, Italian Summer, Live on Radio and Magic on Video, Halloween DJ’s and other outings. Well, this year is “almost” over and before the new one begins we thought we’d endeavour to bring you news, thoughts, collection and recollections of the last 4 months and this will include the playlist for a special dj set we did at this year’s Kaparte Oxjam. In July we launched our new album ‘PORTAL’ (available ‘HERE‘) at the wonderful St James The Less in Pimlico (see previous blog). 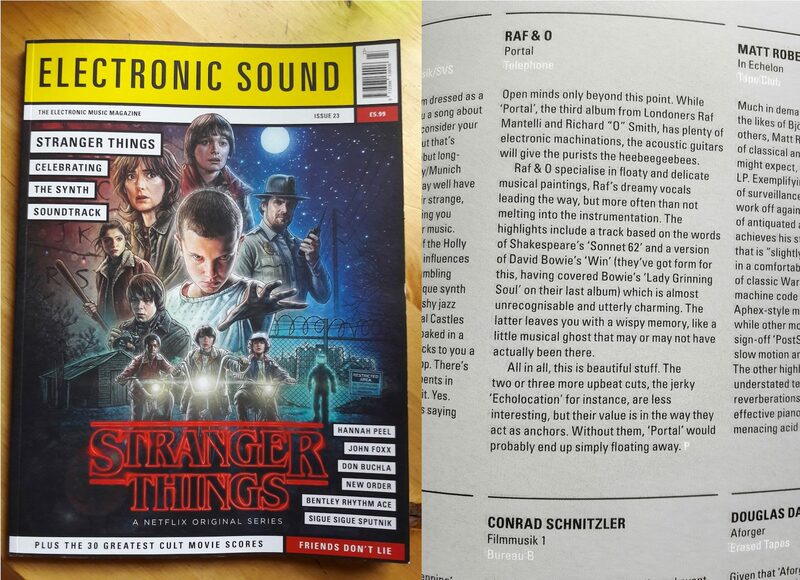 It has now been reviewed on Electronic Sound Magazine! (See picture below for the whole review). We also launched an EP containing two tracks from Portal and two tracks with Raf and O working alongside electronicist and Grace Jones’s collaborator Robert Logan (available HERE). Now, the latest! Raf and O have covered the very beautiful Scott Walker’s ‘Such a Small Love’ as part of ‘Plastic Palace People’, an exclusive streamable and downloadable album curated by God Is In The TV Zine! We’re thoroughly proud to offer this Seasonal gift, which we recorded in Florence for your festive digestive. Listen and free download below. The portal will lead us into 2017. 2016 has been a very strange year, a lot of crazy things happening and a lot of people left us David Bowie included. A very recent trip to the wonderful Lazarus Musical brought forward this consciousness, stirring up feelings and sadness, a shared feeling by Bowie fans across the world. But Lazarus is also a celebration of his artistry and alongside Blackstar, the inner workings of a man facing up to his own mortality. 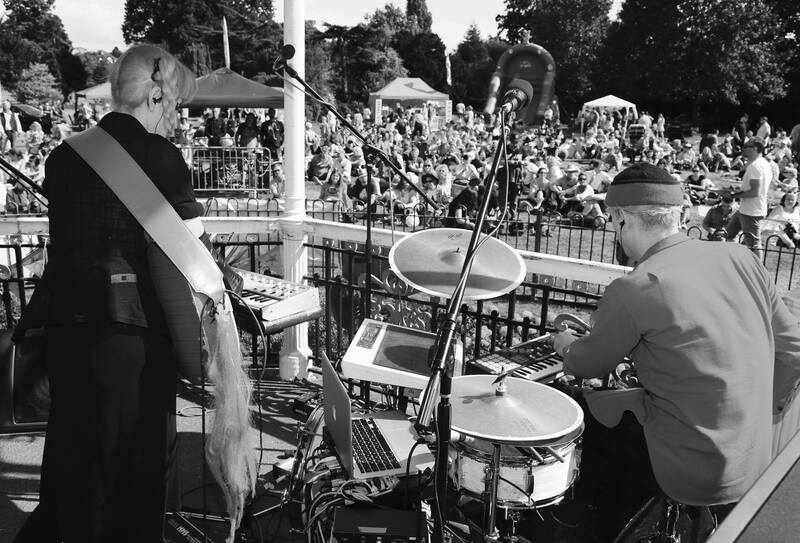 This summer we returned to Beckenham for Bowie’s Beckenham Oddity (formerly Memory Of A Free Festival and Beckenham Free Festival) and it was a complete joy/ honour to perform again as Raf and O. 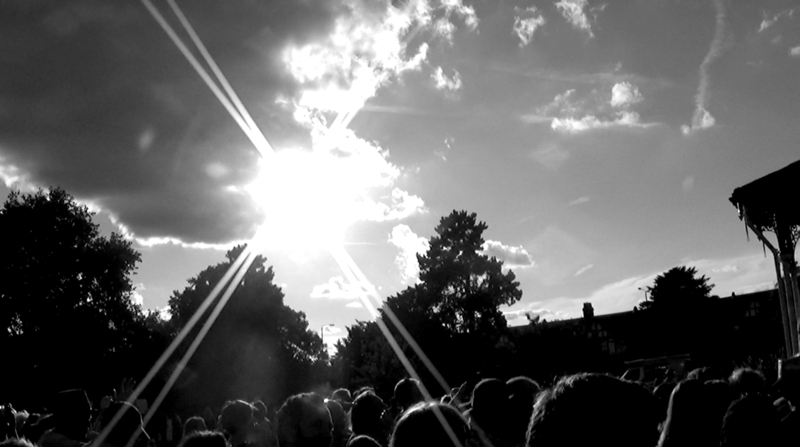 Huge love unified all performers musicians, organisers workers and the crowd, all celebrating the Starman. Lovely contributions by many, a real pleasure to share the stage with Maggi Ronson and the band Jona Lewie, David Live, Clifford Slapper, Amory Kane and more. Thanks to all involved who contributed to make this day very special especially Wendy Faulkner who worked very hard in bringing this year’s festival together and it was brill catching up with Mary Finnigan again who organised the festival with Bowie in 1969. We’ve got some footage shot by the lovely Rhianna, that we’ll post soon, so watch out for that! Alongside new Raf and O material, our set included Bowie’s ‘Lady Grinning Soul’, ‘Win’ included in our last album ‘Portal’ and even a short rendition of ‘After All’. This is us doing our thing captured beautifully by mister Gaz De Vere. Continues below. A Starman in the sky. picture by O. Since the festival, we traveled to Italy to do some writing and recording including our Scott Walker cover, played a few parties and the excellent Frame Live Club In La Spezia (see press above) on the Ligurian Coast where we were warmly welcomed and throughly enjoyed playing the show to such a receptive audience. Thanks to Alan Pride for keeping things running smooth and on our return to the UK we were kept fairly busy supporting TE Morris from Her Name Is Calla at Chaos Theory’s Whispers and Hurricanes, putting together a special Dj Set (see above) for this year’s Kaparte Oxjam at the Slaughtered Lamb and we played a live session on the Dexter Bentley’s Hello Goodbye show on Resonance FM alongside The Monochrome Set. 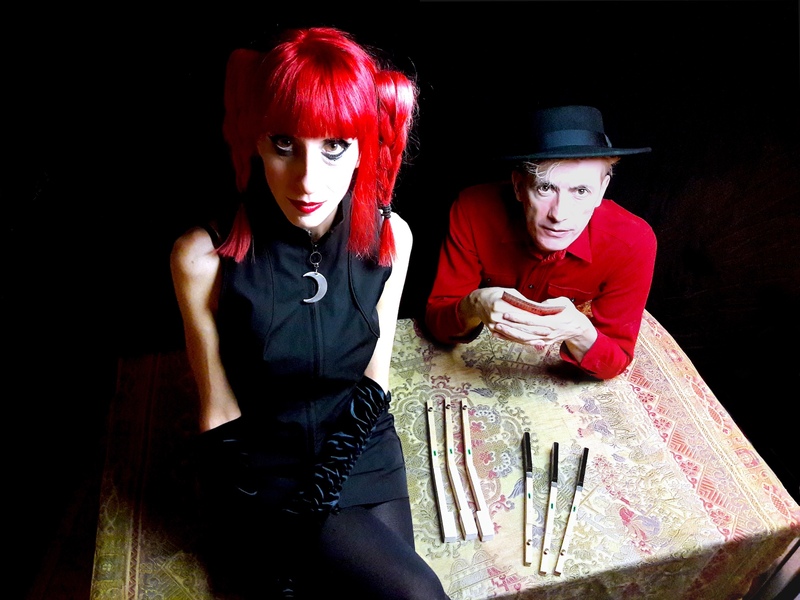 In the words of Dexter Bentley “the original post-punk / arch-pop pioneers The Monochrome Set, plus ethereal, futuristic folk duo Raf & O”. And Monolith Cocktail also featured ‘Portal’ in the top albums of 2016. Here below is the podcast Raf and O live on Resonance FM and following that is our live performance of ‘Magic’ from ‘Portal’ lovingly filmed and edited by Riff Underground and Peter Junge. Many thanks to them both and to Chaos Theory for this video. And to bookend the year, Raf and O just performed at the Xmas edition of the one and only Scaledown in the heart of London. We have a few things brewing but for now wishing you all a peaceful, productive, engaging holiday and see you back in 2017.